William Oliver Hardy was the second son of Joseph and Bessie Hardy. He was born in Stewartstown on 12th July 1886. He was one of ten children. His father was a coachman and was reported to have links with Lissan House, Cookstown. William was a railway clerk. By 1911 the family had settled in Belfast. William enlisted in Belfast. 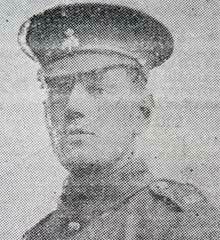 Private Hardy was training with the 14th Battalion Royal Irish Rifles (Young Citizen Volunteers) when he died of illness died of illness at the Military Hospital, Donegall Road, Belfast on 13th July 1915. Donaghendry Church of Ireland Churchyard is in the centre of Stewartstown, County Tyrone, on the Coagh Road (B160). 3 Belfast War Memorials Listed on ROH in Saint Nicholas’ Church, (Lisburn Road) Belfast.